Sea levels are rising and coastal marshes are getting wetter. 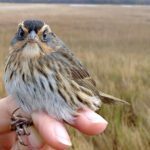 In addition to affecting coastal communities, these changes have consequences for the many species that live in marshes, and recent evidence shows that several of these species are suffering rapid population declines. If we are to prevent the extinction of these species, we either need to find ways to slow the loss of suitable marsh habitat or we need to allow marshes to move inland with the rising waters. So-called “marsh migration”, is emblematic of a key adaptation strategy for ameliorating the effects of climate change. Whether it is to accommodate rising oceans, warming temperatures, or changing rainfall patterns, allowing habitats to move in conjunction with shifting physical conditions is often assumed to be the best hope that many species have for avoiding extinction. Yet, we know little about the practical implications of this assumption, especially in areas where most land is privately owned. At high tide, marshes flood, causing nest losses for birds that build nests in the marsh grasses. 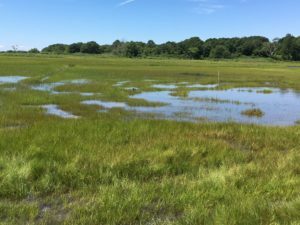 As sea-levels rise, marshes are getting wetter and beginning to “migrate” into the adjacent uplands (Barn Island WMA, Stonington, CT). In the northeastern United States, coastal land is largely in private ownership. 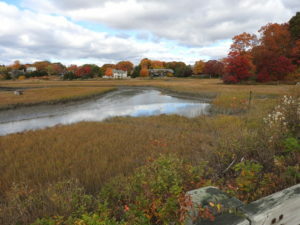 For example, in coastal Connecticut there are estimated to be more than 30,000 landowners with properties in areas that are expected to be affected by sea-level rise this century. How much coastal marshes can move into these areas will depend a lot on the actions of these people. 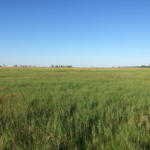 With this in mind, we set out to understand the attitudes and beliefs of these landowners towards various conservation actions that could help protect marshes and the organisms that live in them. Over a thousand landowners responded to our survey, of which almost half were unlikely to participate in any conservation actions, and 1 in 5 said they were likely to build some form of shoreline protection within the next 20 years. Shoreline protection, which includes building structures like sea walls, can help protect infrastructure, but can both hamper marsh migration and cause erosion of adjacent areas, potentially shifting problems to neighbors and to unprotected natural habitats such as marshes and beaches. Of those surveyed, few landowners (7%) expressed an interest in participating in a conservation easement – one of the most common strategies used for land protection in the US. Participation might be higher if the monetary incentives given to landowners were raised above current levels, but this would clearly increase the cost of conservation. Other conservation strategies were more favored by landowners, but these approaches are also likely to be more expensive. For example, almost a fifth of landowners expressed interest in outright purchase by a conservation organization, and even more favored future interest agreements – a novel strategy in which conservation groups would be guaranteed ownership of a property if it lost more than half its value due to flooding, but which requires that they pay the landowner the fair market value at the time the agreement is made. In many areas, most of the land adjacent to coastal marshes is privately owned. 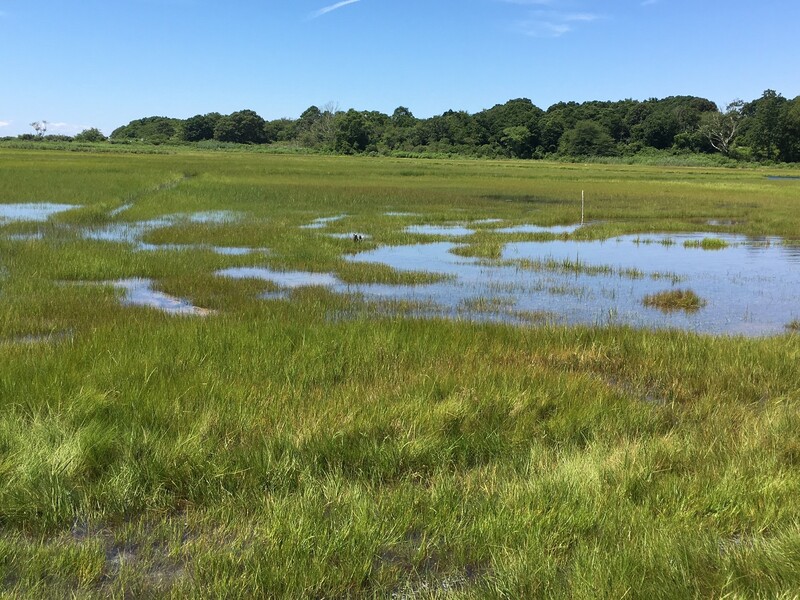 Whether marsh migration can effectively replace marsh losses as sea-level rises, will depend on the actions of those private landowners (Fence Creek, Madson, CT). These results suggest that ensuring protection of the best sites for marsh migration will require more active engagement with landowners. Perhaps the biggest impediment to landowner participation is convincing people that they will receive appropriate compensation for their property losses. Few (7%) respondents to our survey believed they would be offered an incentive to participate in conservation, and two-thirds worried about receiving a fair price for their property. Working to ensure that landowners know the options available to them, and building trust that they will be treated fairly, is clearly important. The research also highlighted some unexpected, but in hindsight unsurprising, results. For example, conservation groups often assume that educating people about climate change will lead to decisions that benefit conservation. We found, however, that those who acknowledge the reality of climate change also say that they are more likely to build shoreline protection. Increased understanding, therefore, has potential to lead to actions that damage natural systems, unless it is coupled with education about the consequences of different responses. Even then, the potentially high costs to landowners faced with property loss due to sea-level rise will likely limit the options for ecosystem protection. Overall, the study illustrates the need to understand the human component of conservation. Ecological predictions about where species will occur in the future need to be coupled with information on societal responses to determine what is really plausible. The projected area over which marsh migration can occur, for example, is far more extensive than what society is likely to allow. Ensuring that coastal marshes, the species they support, and the other services these wetlands provide people, persist into the future will require that we understand human behavior as much as the ecological responses to climate change. This research was led by SHARP PhD student Chris Field, in collaboration with Ashley Dayer of Virginia Tech and SHARP PI Chris Elphick. It was funded by Connecticut Sea Grant, the Connecticut Department of Energy and Environmental Protection, the University of Connecticut College of Liberal Arts and Sciences, and a Robert and Patricia Switzer Foundation Environmental Fellowship to Chris Field.